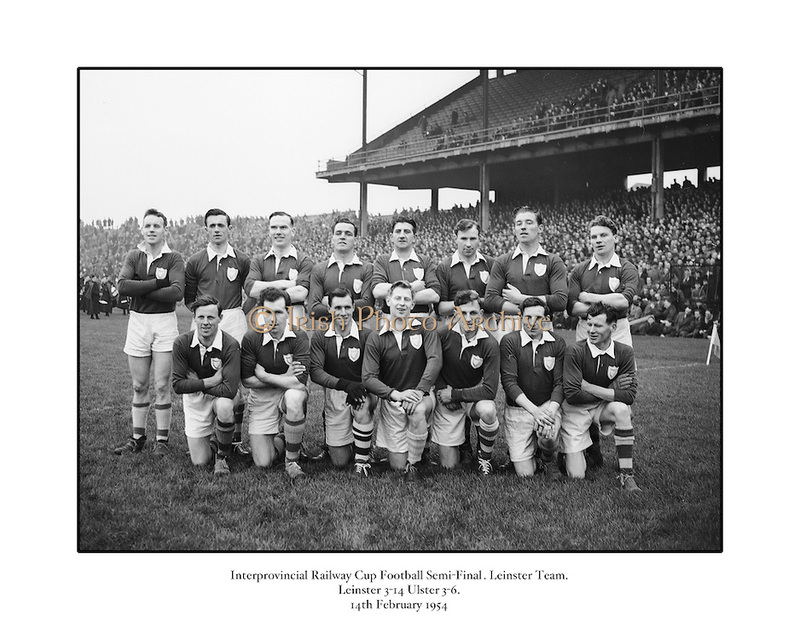 Neg No:.401/5669-5673...14021954IPFCSF1...14.02.1954..Interprovincial Railway Cup Football - Semi-Final..Leinster.3-14 .Ulster.3-6...Leinster. ..J. O'Neill (Wexford), M. O'Brien, P. O'Brien, K. McConnell (Meath), G. O'Reilly (Wicklow), P. Dunne (Laois), A. Murphy (Carlow), J. Rogers (Wicklow), S. White (Louth), J. Reilly (Meath), O. Freaney, C. O'Leary (Dublin), P. Meegan (Meath), J. McDonnell (Louth), K. Heffernan (Dublin). .